In recent years, we’ve seen machinery evolve, becoming smarter, using less fuel and producing fewer emissions. Using telematics, today’s equipment can also communicate — tell us when a repair needs to be made, set limits on how deep an operator can dig, or alert the owner if someone tries to steal it. It’s downright amazing how smart technology is beginning to impact the construction industry in diverse ways. So, what’s next? What does the future hold for construction equipment? At Camso, our team of engineers is busy addressing and designing for three up and coming technology trends that we believe will impact construction equipment in the not-too-distant future. Autonomous construction equipment: Imagine a fleet of equipment that can either be operated remotely, or without an operator at all. That day is coming! Smart technology: The data that equipment is producing today is just scratching the surface of what’s possible. In the future, different machine components will be able to communicate with each other further enhancing telematics and predictive systems. Fuel savings: Machinery is getting lighter and more efficient, helping to reduce operating costs, without sacrificing performance. 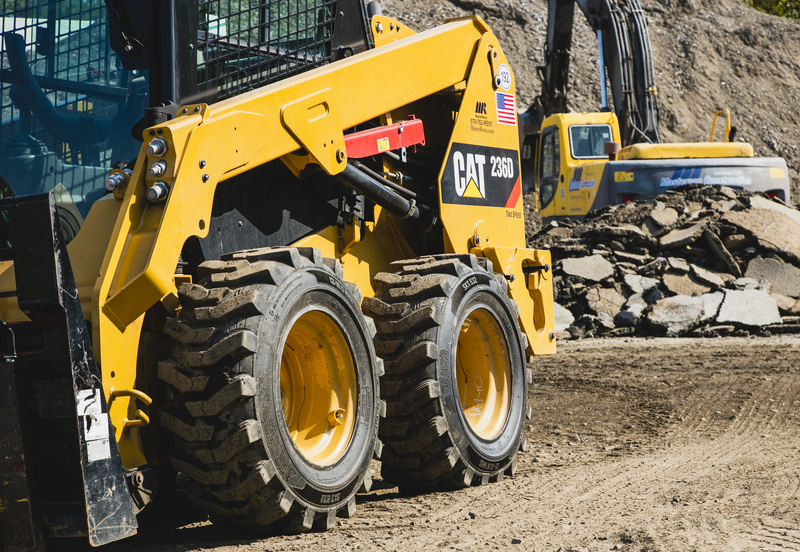 To achieve these future development milestones, the Camso team is working side-by-side with OEMs and contractors alike to research, collect data and conceptualize tires, tracks and track systems that will be able to meet the demands of tomorrow’s advanced construction equipment. We believe that what propels a machine, provides flotation, traction and stability, are tires and tracks, and act as a vital component of these construction technology trends. For a better look at why, we need to dig deeper into each of these trends. You can’t go a week without hearing something about driverless vehicles. Someday soon, everyone in the car will be a passenger during their daily commute. For construction and mining operations, that type of technology can’t just stop there. We need equipment to be able to function without anyone in the cab at all. Tire and track technology is critical in these operations because getting a flat tire or unexpected downtime just cannot happen. Flat-free solutions like solid tires and tracks are trends we already see in the construction industry today, and it will become even more of the standard in the future. A broad-reaching term used to describe a lot of different advances, at its core smart technology is all about machines getting smarter and communicating. The key questions Camso is addressing right now are what kind of information is valuable to collect, how do we collect it and finally, how do we use and share it. Using embedded sensors and other resources, the possibilities are endless for construction equipment functionality. In our area of specialties, we see large earthmover tires helping to make adjustments to the way a machine is operated by tracking operating hours, air pressures and temperatures. Using that information, operators and fleet managers can make more better, quicker decisions to helping to reduce expenses and increase productivity. We are developing smarter tires and tracks for smaller compact equipment, too. We want to make sure no matter what size of equipment you operate you can access information that delivers value. In addition to labor and equipment expenses, fuel costs are a significant expenditure for most operations. In many sectors of the construction industry, we see a rise in electric and hybrid equipment. It’s a trend that will continue to impact more segments of the industry as engineering knowledge and capabilities continue to grow. Developing products with a lower rolling resistance is key to achieving a lower energy consumption. Weight is also a big consideration. To achieve the required output of energy to lift, transport or dig, electric and hybrid equipment needed to be lighter. However, weight reduction could not come at the expense of performance, which means everything from the tires to other components of a machine need to reduce weight. We’ve worked with several manufacturers to meet those requirements. And, we know the trend for lighter, more fuel-efficient machinery will continue to evolve into gas- and diesel-powered equipment. From today’s equipment trends to the technological advancements that will be the standard for the construction industry in the future, the team at Camso is working diligently with forward thinking OEM partners to make it happen. We are in the field every day keeping pace with all the latest trends and providing solutions to keep you productive and profitable.